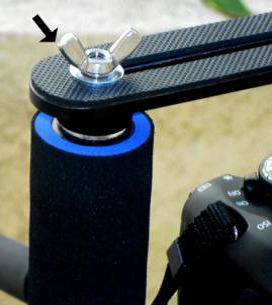 If you’re using an HDSLR camera to shoot video, this post will provide you with step-by-step instructions for building a stabilization frame to hold accessories. 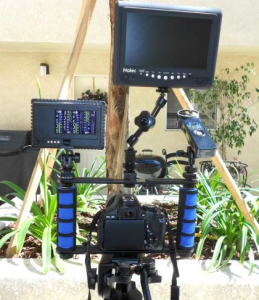 Probably any small camera could be outfitted with a similar rig, really but this particular DIY accessory frame was built by a reader and contributor to this blog, Andre Campbell, for use with his HDSLR. 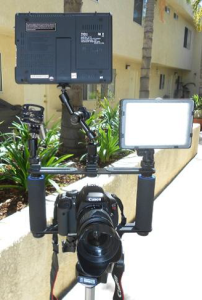 Having worked with dozens of styles of video cameras over the years, I have no doubt having an easy way to attach lights, mics, teleprompters or monitors is always a benefit to a videographer who wants quality images and sound. This rig is an ingenious as any I’ve seen so I appreciate Andre letting me publish his parts list and instructions. As you can see by the pictures, this one is sturdy enough to hold two accessories at the same time, with extension arms for placement and balance. If you’d enjoying having an accessory holder for your camera, here is how to make it yourself for less! HDSLR cameras come with a hot shoe on them. 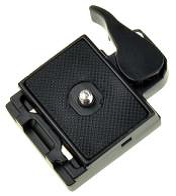 A hot shoe is a mounting point on the top of the camera where you attach a flash unit. You may have heard it referred to as an “accessory shoe.” When using a hot shoe, pressing the shutter release button to take the picture will fire the flash. HDSLR cameras are popular for shooting video but have a few frustrating limitations. HDSLRs were made to hold one flash. That’s often not enough, especially for video shoots. 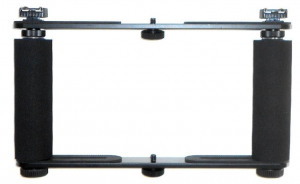 So I was looking to buy an accessory bar to put into the hot shoe to hold more than one item. I have many items. I didn’t want to put undue stress on that hot shoe. I have no idea what it can hold in weight before something goes wrong. 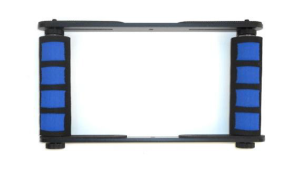 Below is a small extender bar to go into the camera’s hot shoe and you can add one or two items to the top of your camera’s hot shoe. I was considering this as my first option. I looked around online and saw lots of rigs, some are made by companies and others were handmade as part of a DIY project. Most of them are made to act as a stabilizer, so you can carry your camera in both of your hands and keep a steady shot. My interest in making the frame was for shooting documentary interviews, which of course means I’d use it in a more of a stationary way. However, I also want to do more hand holding. 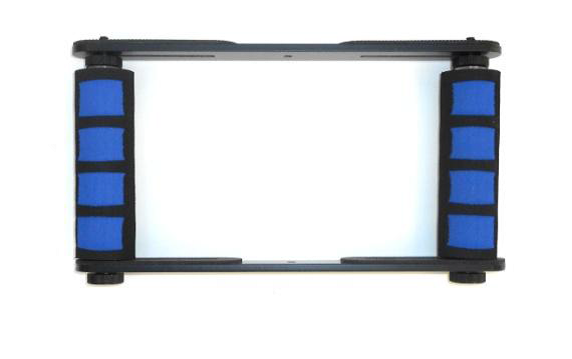 As a byproduct of the accessory DIY frame, it will become a hand holding stabilizing product or rig for me. And because I was looking for a hot shoe extender bar (they are short), this gave me the idea to look for something bigger, but not for the camera’s shoe. Since I like the look of a frame and not a cage, and they’re a little higher in price, I decided to try a DIY build. By mapping out what I needed and then deciding on my parts, I sent away for all the eBay items roughly at the same time. I got all my frame parts from either “bidding low” or finding “buy now” items. I looked for free shipping to cut down on the cost. I was hoping for a price of less than $30 for my build. Without the extra “extenders”, I was under the cost. I found that about $70 was the lowest frame/cage rig price online at eBay or at other camera related items websites, so mine was essentially half price from a ready-made model. The brackets are about 10 ½ ” long. 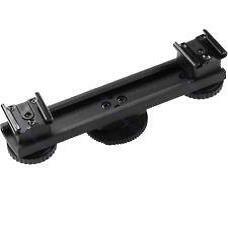 Actually they are for mounting two flashes on to them or maybe putting them on a light stand (or tripod) that has a screw on the top. (Not all of them do.) Also as an extender, you can place your camera on one side, and put your flash on the other end. 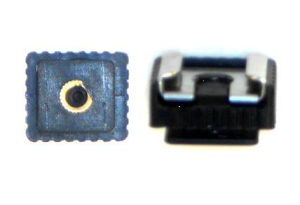 They each come with two mounting screw adapters, that can slide in the long holes. They come mounted on. You can take them off or add more by sliding it to the end where there are screw groves, and you catch the groves and slowly turn to remove or to add one. 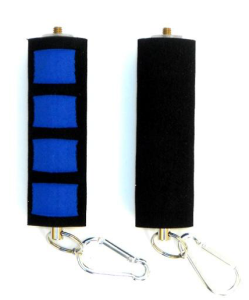 They also have rubber grips on top to help protect things as best as they can. There is also a hole in the middle that can take a ¼”-20 screw on both brackets. The mounting screws have holes on the bottom of them, to screw things into them. I found these sponge handles (almost 4 and 3/4’’) grips that can be use to screw into a point and shoot camera, and attach it to your belt loop when not shooting. They have ¼”-20 screw on one side and an opening on the other when you detach the belt ring. You can put two together and make one long 4 handle. 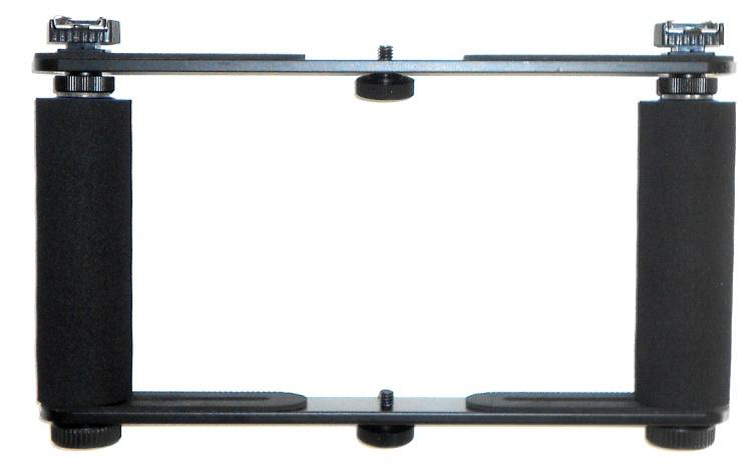 You need something to hold the top of the accessory frame together. These shoe mounts are going to act like a nut on the end of the mounting screws at the top of the DIY accessory frame. When you are setting up your accessory fame, mount these items, from the top down first. Set your shoe mounts in the right direction you want and then screw into them. They have a ¼”-20 hole on the bottom, you can put them on a tripod, or any other pole with the same size screw. Now to attach the frame to the tripod. I used two more mounting bracket screw adapters for the frame. One to go into the top and one for the bottom. Theses screw adapters also have a hole in the bottom of them to screw into the tripod. I got two more mounting bracket screw adapters that were a “little taller” than the ones that came with the brackets. I used them for the bottom bracket and I screwed them into the bottom of the grip handles. I just moved the original screws in the bracket to the end, and unscrewed them and replaced them with the new taller ones. I put the original mounting bracket screw into the center hole on the bottom bracket in order for the tripod plate to be screwed into it. As you can see, there is a ¼”-20 hole in the bottom of each screws. The other screw went to the top bracket middle hole. 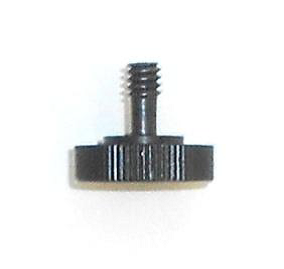 I had another cold shoe adapter hanging around and added it to the top middle screw on the top bracket. That gave me an accessory point there. With the mounting bracket screwed in the middle of the bottom bracket , I now screwed it into the camera’s bottom. (Or unless you have a release plate there) Do that first, then attach the tripod plate to the bottom of the bracket. 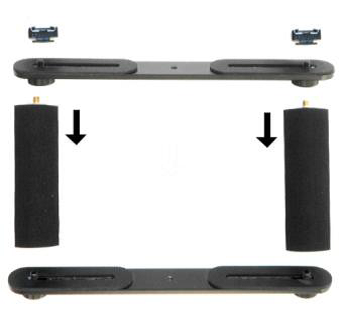 When you get all of the parts, you can start to assemble your DSLR accessory frame and stabilizer rig. Just don’t over tighten the rig mounting screws. If you add the two extra screw adapters to the brackets, by slowly screwing them in; you have your accessory frame and stabilizer nearly ready to go. You can add a camera to the bottom bracket and screw that in first, then you can attach a tripod plate to the bottom of it. Then you can use your tripod as a table to hold your frame, so you can rest yours arms in between your movie shots. Now, if you’re just interviewing people, then you are set to go when your frame is sea worthy, and you’re ready to shoot. The finished accessory frame and stabilizer rig! One thing about this build is that when you are finished, you can unscrew everything, take it apart and fold it flat for travel or until the next time you need it. You can add a quick release plate to the bottom bracket, ($10 or less on eBay) that will allow you to slide out your camera to change batteries quicker. We test for integrity of the frame before doing any shooting. This is a DIY frame accessory stabilization rig. It was an “experiment.” It was less expensive than other rigs, and it also may not be as solid as them. Don’t forget to run the neck strap through your arm or around your neck when doing hand held shots for camera safety. You need to make sure every time you use it, it is put together correctly and tightened correctly. You must be the judge. Test before using. One more thing again, do not over tighten this DIY! Thanks for your time, hope this helps a little, tell me what you think? Leave a comment below! Andre’ Campbell is an award winning, producer, director, editor & writer. He got his start in documentaries at KHJ channel 9 (now KCAL) in Los Angeles. Then he moved into working in Hollywood on Films, television and commercials; a great training ground for learning to produce content. He has worked as an online film editor, while working at ABC-TV Channel 7, as a news video editor cutting news packages. He has produced and directed eight documentaries, and his last one received a “Certificate of Reconnection” award from the State of California for production. Andrea has also Produced and/or Directed six shorts films. He has received to-date fourteen awards for his production efforts. Andre’ has written 4 books that are on Amazon, and two are on Filmmaking. Presently he is working on his fifth book. Thanks Andre. You made putting together something that is possible for the rest of us. And everything is on EBAY! Kudos. I agree, Andre did indeed do a fantastic job! I appreciate him sharing. yes,,,excellent cage,,,these retail for hndred or more fully built,,,this is great,,,im ordering the parts now,,,excellent,,,tnx. 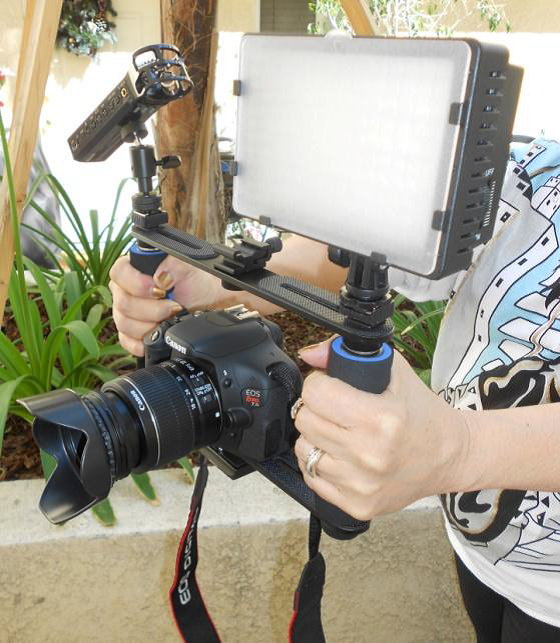 So glad you liked the stabilizer/holder! Indeed it is cool. Make sure and download the PDF as it has more info than what is in the post. Good luck with building your rig! Wow! This rig looks fantastic! I cant wait to get these parts ordered and to build my own for my D7100 and then to try shooting some video. Great find! Hi, great construction for a dslr videographer. I have just bought a C100. All I can say is wow. This is my first visit to Lorraine’s blog and I’m very impressed with this post. I’m not a big video creator and don’t laugh but all I use is my Flip camcorder. I know but it works pretty good for me right now. I know I should upgrade and do more business like videos with the backdrops and better lighting. I guess that just makes me nervous because that all seems so expensive. But thank you for sharing this and from what I hear this is the better route to take. Glad I dropped by and now I have someone I can trust. I am so glad you enjoyed the post! I would never laugh at someone using a Flip cam. I love those little things and have a Kodak Zi8 myself, which is real similar. They actually do a great job. Kind of flimsy, but what do you want for $100! Better lighting is always key, but it does not necessarily have to be expensive. Here is a blog post with a video demo of me using windows and standard light fixtures to make professional looking lighting. It is all about placement! Thanks Adrienne. I loved your blog too and got signed up for your newsletter. If you have any other video related questions, let me know! Wow that is awesome! I like it…I’m looking forward to have one for my studio! Yes it is rather lovely, isn’t it? Thanks for your comment! Glad you liked the article. I always enjoy helping people learn to make video.